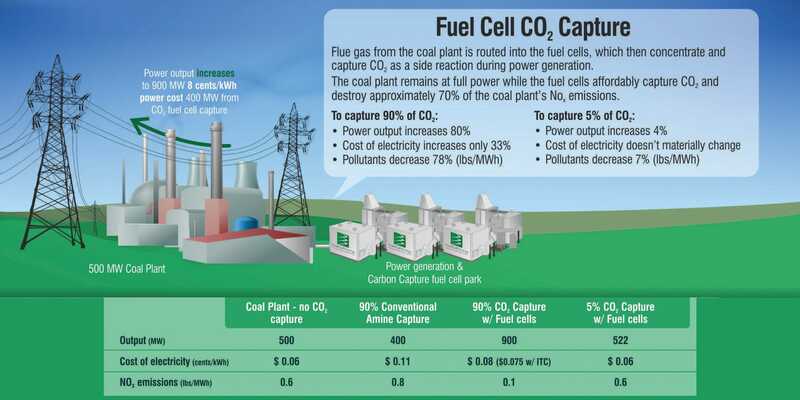 FuelCell Energy’s scalable and affordable carbon capture solution captures carbon emissions from existing coal or gas-fired power plants, while simultaneously producing power. The solution is scalable so the amount of carbon capture can be increased over time. The fuel cells also destroy approximately 70% of the plant’s smog-producing pollutants. The capability to efficiently and affordably capture carbon while simultaneously producing power enables emission compliance in a manner that provides a revenue stream and returns on capital from the sale of power produced by the fuel cells. In a typical SureSource application, clean natural gas is combined with ambient air for the fuel cell power generation process. Due to the unique capabilities of the carbonate fuel cell technology, the exhaust flue gas of coal or gas-fired power plants is directed to the air intake of the fuel cells when configured for carbon capture. The fuel cells act as a carbon purification membrane, transferring CO2 from the air stream, where it is very dilute, to the fuel exhaust stream, where it is concentrated, allowing the CO2 to be easily and affordably captured, chilled and compressed for industrial use or sequestration. Scalable & Affordable – Fuel cell plants can be added incrementally in a cost-effective manner; starting with as little as 5% capture with no appreciable change in the cost of power and with minimum capital outlay. To achieve 90% capture, the cost of power for a coal-fired plant is increased by only $0.02/kWh, while conventional carbon capture technologies for coal-fired power plants almost double the cost of power. 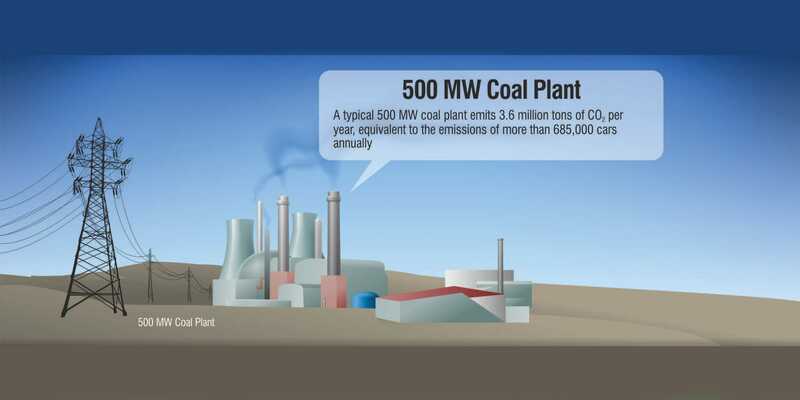 Produces, rather than consumes, additional power – Generates additional power – cleanly and efficiently – during the carbon capture process, contributing to the existing coal plant’s total output. 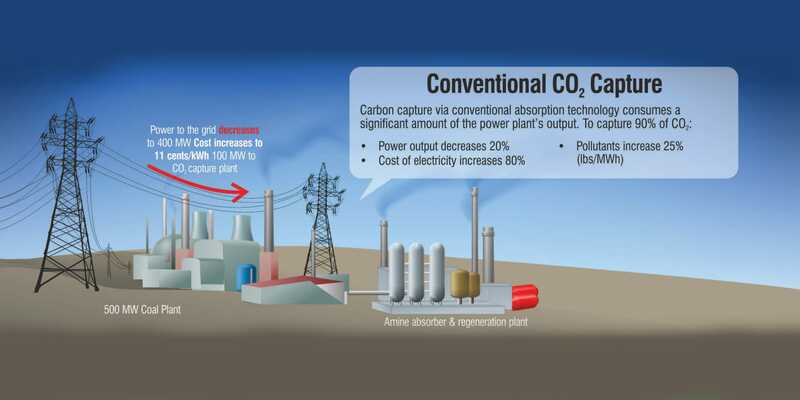 In comparison, conventional carbon capture technologies consume about 20% of the plant’s overall power output. Destruction of pollutants – Captures and separates CO₂ from the flue gas of coal and gas-fired power plants while simultaneously destroying approximately 70% of the smog-producing nitrogen oxide (NOx). Return on Investment – Generates a return on capital rather than an increase in operating expense, extends the life of existing coal-fired power plants, and enables low carbon utilization of domestic coal and gas resources. Proven Solution – Millions of megawatt hours of ultra-clean power generated by SureSource power plants globally. 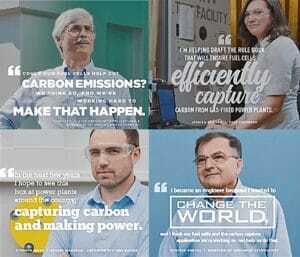 Since SureSource power plants produce power efficiently and with virtually zero emissions, the net result is a compelling carbon capture solution for preventing the release of greenhouse gases by coal or gas-fired power plants, while simultaneously increasing overall net efficiency and clean power output in an affordable manner for ratepayers.